As Americans, we have always cherished our alcohol. Indeed, it was once believed that the more we drank, and the wider variety of which w e drank, the better our health. Today, we drink, on average, about 2.3 gallons of alcohol per year. But in 1790, Americans drank 34 gallons of beer and cider, five gallons of distilled spirits, and one gallon of wine—and you thought you had problems. It wasn’t until we started consuming coffee, the powerful stimulant, did we become a bit more “productive at work.” They even drank their chocolate. Then, as well as now, you couldn’t get a more local craft beverage than hard cider. It was the FIRST homebrew. We made cider before we made beer, before we made wine, before we even started distilling spirits. Everyone in the working classes drank it; it was cheaper than rum and later whiskey. Farm laborers were paid in cider. Children drank cider. Our Presidents drank cider for breakfast. Water was just plain untrustworthy. And in 1840, William Henry Harrison beat out candidate Martin Van Buren for the American Presidency by running a “log cabin and hard cider” campaign. Supposedly, there were barrels of cider outside voting centers. It’s in our blood, folks. 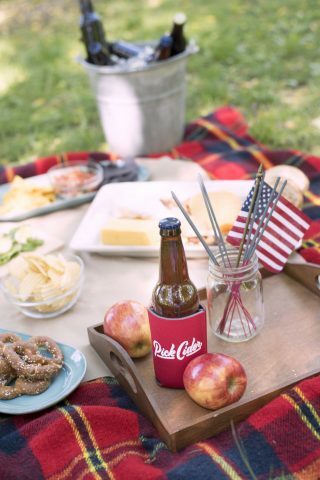 So if you are feeling a bit American this 4th of July, and wish to raise a glass to all those who came before us, pick CIDER, our national celebratory drink. They did. You should too. Cheers!